Reinforce skin with the Vichy 48hr Anti-Perspirant Treatment Roll On a breakthrough formula that keeps skin fresh and dry. This lightweight antiperspirant continuously regulates perspiration for 48 hours, offering effective protection without blocking the pores or irritating the skin. Its long-lasting effectiveness means that the antiperspirant need only be applied twice a week, even after bathing. Proline Cutei, a soothing, anti-irritating, organic amino complex quickly relieves irritation. The skin is left looking soft and smooth, with a supple and healthy feel. 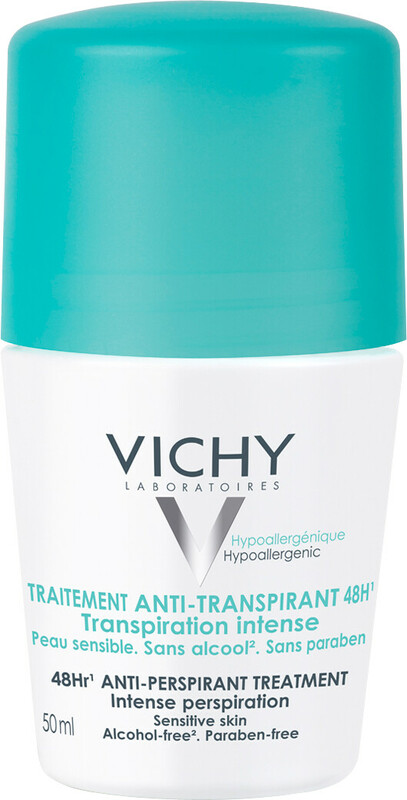 Vichy 48hr Anti-Perspirant Treatment Roll On 50ml is rated 4.7 out of 5 by 56. Rated 5 out of 5 by Diamond123 from The best of the best Bought for myself and for my teenager daughter who use to sweat before very badly. Now we don't have that problem anymore. Will recomend it 100%. worth of the money what you spend on them. Rated 5 out of 5 by RXRIVEXA from My Best New Purchase I have purchased many anti-perspirants before and honestly don't think I'll buy another anti-perspirant again. I generally use this product twice a day (1x AM and PM) and have found that it lasts long, keeps me dry, smells fresh and doesn't leave any residue. I can't wait to purchase it again. Rated 5 out of 5 by Anonymous from Awesome product This is by far the best anti-perspirant that I have ever used. It does exactly what it says, keeps you fresh 48 hours and has a really nice smell. Unlike others, it keeps you fresh, not only smells good. I got it for a good price too as there was a discount which I was pleased with. Overall, I would recommend this product to anyone who is looking for a good anti-perspirant roll that will actually work.